Welcome to Paper.Scissors.Cake Art Studio! - Paper.Scissors.Cake. Welcome to Paper.Scissors.Cake Art Studio! Paper.Scissors.Cake. is a modern, cozy children’s art studio that strives to enhance the creative energy that children of all ages hold in an atmosphere that is fun and non-competitive, and one that is comfortable and inspiring to adults as well. We aim to offer an inspiring and contemporary arts experience for all. 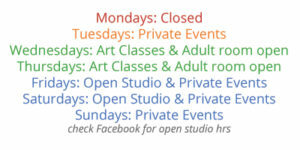 Join us at our studio in Woodstock, Georgia for open studio, an art class class, birthday party, or shopping experience. We’re proud retailers of Melissa & Doug arts and crafts supplies.